梁光河. 2018. 海南岛的成因机制研究[J]. 中国地质, 45(4): 693-705. LIANG Guanghe. 2018. A study of the genesis of Hainan Island[J]. Geology in China, 45(4): 693-705. (in Chinese with English abstract). Fund support: Supported by the key special project "Deep structure and mineralization process of the northern accretion orogenic metallogenic system" (No. 2017YFC0601204) of National key research project "Deep resources exploration and exploitation" and the subproject "Seismic Exploration System for Metal Deposit" (No. ZDY2012- 1- 06) of National Major Research Equipment Development Project "Research and development of deep resources exploration core equipment"
About the first author: LIANG Guanghe, male, born in 1965, associate researcher, engages in mineral resources exploration, geotectonic and seismogenic mechanism research; E-mail:lgh@mail.iggcas.ac.cn. Abstract: Hainan Island is a relatively independent block located in the southern part of the South China Block. There exist many viewpoints for its origin. 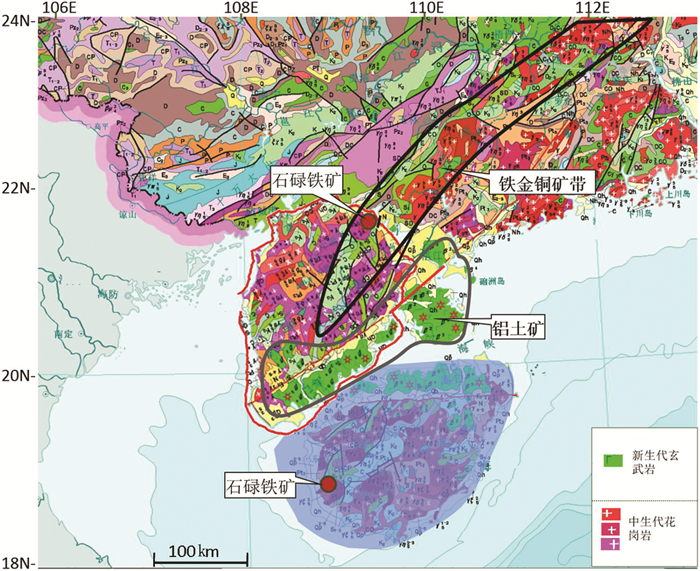 This paper is based on the systematic analysis of many pieces of evidence such as geographic geomorphology, strata, fault zone, magmatic rock, ore belt distribution, seismic exploration profile, paleontology, and genesis of three basins surrounding Hainan Island. 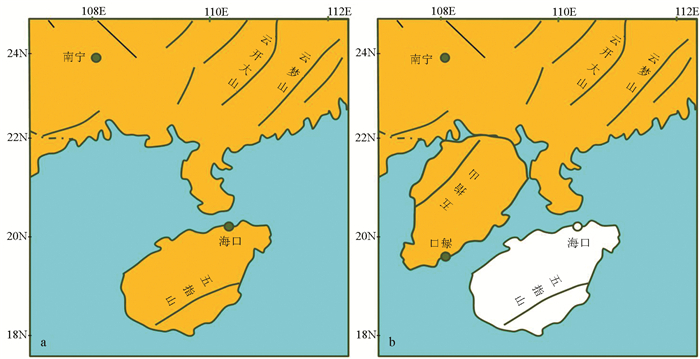 The results show that Hainan Island was separated from Beibu Gulf and rotated about 150℃ounterclockwise from the original position to the current position. The starting time for the separation is about 65 Ma, and the main rotation drift occurred at 40-24 Ma. At present, it is still drifting toward the southeast and is accompanied by counterclockwise rotation. The genesis of Hainan Island is closely related to the collision process between the Indian Plate and the Eurasian Plate. The dynamic mechanism is that the large-scale extrusion and rotation of the Indochina block has driven Hainan Island's fission and rotation drift from South China. This study provides remote constraints for the structural evolution of the collision process. At the same time, it also has certain guiding significance for the study of the metallogenic belt in Hainan Island. Chen Changzheng, Chen Wei, Wu Feng, Chen Wei, Zhou Jinfeng. 2014. Structural physical simulation research of eastern Maichen sag[J]. Petroleum Geology & Experiment, 36(4): 516-522 (in Chinese with English abstract). Chen Guoda. 1956. Examples of Chinese platform and Discussions of "Cathaysia"[J]. Acta Geologica Sinica, 36(3): 239-271 (in Chinese). Chen Guoneng, Wang Yong, Chen Zhen, Peng Zhuolun. 2017. Advance and consideration on the mechanism of formation and emplacement of granitic magma[J]. Acta Petrologica Sinica, 33(5): 1489-1497 (in Chinese with English abstract). Chen Haihong, Sun Shu, Li Jiliang, Maia Haag Jon Dobson, Xu Jinghua, Friedrich Heller. 1994. Paleomagnetism and tectonics of South China in Early Triassic[J]. Chin. J. Geol., 29(1): 1-9 (in Chinese with English abstract). Cheng Yuqi. China Geological Map(1: 5000000)(Second Edition)[M]. Beijing: Geological Publishing House, 2002. Gary A. Glatzmaier. 2013. Geomagnetism[M]. University of California, Santa Cruz. Hall R. 2002. Cenozoic geological and plate tectonic evolution of SE Asia and the SW Pacific: computer-based reconstructions, model and animations[J]. J. Asian Earth Sci., 20(4): 353-431. Hou Wei. 1992. Basic characteristics of crustal evolution in Hainan Island, China[J]. Geotectionca et Metallogenia, 16(2): 131-140 (in Chinese). Ji Shaocheng, Wang Qian, Sun Shengsi, Xu Zhiqin, Li Haibing. 2008. Asian continent escape structure and seismic activity in China today[J]. Acta Geologica Sinica, 82(12): 1644-1667 (in Chinese with English abstract). Jia Shixu, Li Zhixiong, Xu Zhaofan, Shen Fanluan, Zhao Wenjun, Dun Yonghong. 2006. 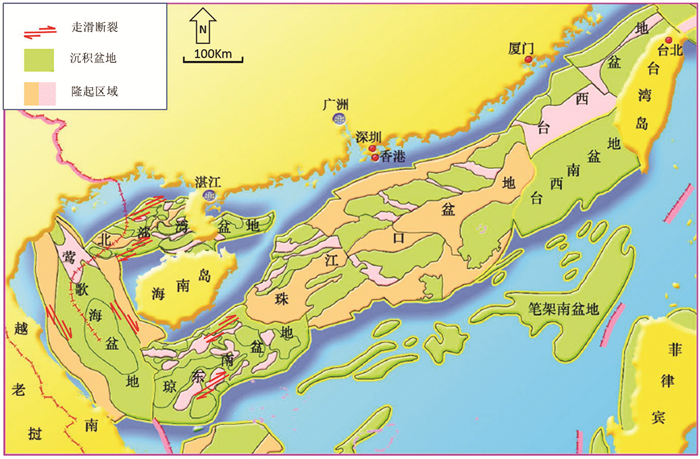 Crustal structure features of the Leiqiong depression in Hainan Province[J]. Chinese J. Geophys., 49(5): 1385-1394 (in Chinese with English abstract). Lee T Y, Lawver L A. 1995. Cenozoic plate reconstruction of Southeast Asia[J]. Tectonophysics, 251(1/4): 85-138. Li Chunrong, Zhang Gongcheng, Liang Jianshe, Zhao Zhigang, Xu Jianyong. 2012. Fault structure in Beibu Gulf and its controlling effects over gas and oil[J]. Acta Pertrolei Sinica, 33(2): 195-203 (in Chinese with English abstract). Li Siguang. 1962. Introduction to Geomechanics[M]. Beijing: Science Press, 228 (in Chinese). Li Siguang. 1974. Rotation Shear Structure[M]. Beijing: Science Press, 83 (in Chinese). Li Sitian, Zhang Qiming. 1997. Basin forming mechanism and its dynamics types[C]//Gong Zaosheng Li Sitian, Wang Shanshu(eds. ). Continental Margin Basin Analysis and Hydrocarbon Accumulation of the Northern South China Sea[M]. Beijing: Science Press, 111-121(in Chinese). Liang Guanghe. 2013. Eight evidences about Hainan Island separated from China's Beibu Gulf with drifting and rotation[J]. Acta Geologica Sinica, 87(Supp): 73-76 (in Chinese). Liu Yuyan, Morinaga. 1999. Cretaceous palaeomagnetic results from Hainan Island in south China supporting the extrusion model of Southeast Asia[J]. Tectonophysics, 301(1/2): 133-144. Ma Lifang. 2002. Atlas of Chinese Geology[M]. Beijing: Geological Publishing House (in Chinese). Metcalfe I, Sherggold I H, Li Z X. 1993. Gondwana dispersion and Asian accretion:Field work on Hainan Island[J]. IGCP 321 Episodes, 16: 443-447. Neng Yuan, Wu Jingfu, Qi Jiafu, Zhang Gongcheng, He Yuping, Su Kelou, Liao Jing. 2011. Structural styles and distribution features in the deep water of the Pearl River Mouth and Qiongdongnan basins[J]. Nature Gas Industry, 31(8): 32-37 (in Chinese with English abstract). Ren Jishun, Jin Xiaochi. 1996. New observations of the Red River Fault[J]. Geological Review, 42(5): 439-442 (in Chinese with English abstract). Replumaz A, Tapponnier P. 2003. Reconstruction of the deformed collision zone between India and Asia by backward motion of lithospheric blocks[J]. J. Geophys. Res. Solid Earth, 108(B6). Sun Zhen, Zhong Zhihong, Zhou Di, Qiu Xuelin, Wu Shimin. 2003. Deformation mechanism of Red River Fault Zone during Cenozoic and experimental evidences related to Yinggehai Basin formation[J]. Journal of Tropical Oceanography, 22(2): 1-9 (in Chinese with English abstract). Sun Zhen, Zhong Zhihong, Zhou Di. 2007. The analysis and analogue modeling of the tectonic evolution and strong subsidence in the Yinggehai Basin[J]. Earth Science-Journal of China University of Geosciences, 32(3): 347-356 (in Chinese with English abstract). Tapponnier P, Pelt zer G, Armijo R. 1986. On the mechanics of the collision between India and Asia[C]//Coward M, Ries A(eds. ). Collosion Tectonics. Geological Society of London Special Publication, 19: 115-157. Wan Tianfeng. 2011. Geotectonics of China[M]. Beijing: Higher Education Press, 1-501 (in Chinese with English abstract). Xu Deru, Chen Guanghao, Xiao Bin, Chen Tao. 2003. Comment on several important basic geological problems in Hainan Island, China[J]. Geological Science and Technology Information, 22(4): 37-44 (in Chinese). Xu Zhengyu, Yu Guang, Wu Weiqiang, Ma Qinlin, Huang Ling, Xiong Shaoyun, Cheng Gang. 2014. Structural features and controlling on oils in south eastern Beibu Gulf Basin[J]. Petroleum Geology & Experiment, 36(2): 144-152 (in Chinese with English abstract). Yan Jiaan. 2006. Quaternary Paleontology and ecological evolution in Hainan Island[J]. 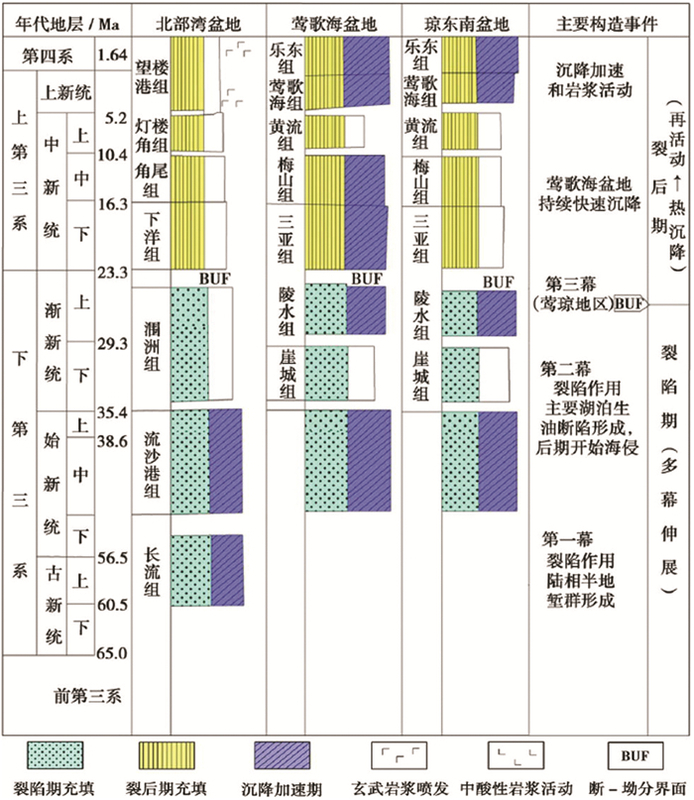 Journal of Palaeogeography, 18(1): 103-114 (in Chinese with English abstract). Yang Shufeng, Yu Ziyi, Guo Lingzhi, Shi Yangshen. 1989. 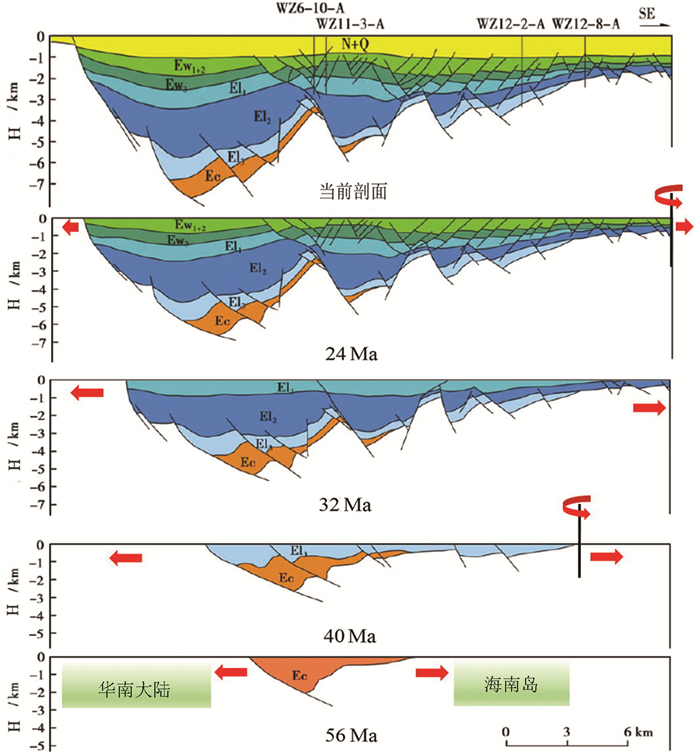 Terrane division, paleomagnetic studies and plate tectonic significance of Hainan Island[J]. Journal of Nanjing University (Earth Science), 1(1/2): 38-46 (in Chinese with English abstract). Yang Zhenyu, Jean Besse, Sun Zhiming, Zhao Yue. 1998. Tertiary tectonic slip in Indo-China Block and lithosphere tectonic evolution in Qinghai-Tibet Plateau[J]. Acta Geologica Sinica, 72(2): 112-125 (in Chinese with English abstract). Yin Hongfu, Wu Shunbao, Du Yuansheng, Peng Yuanqiao. 1999. South China is part of the Tethys Ocean archipelago system[J]. Earth Science——Journal of China University of Geosciences, 24(1): 1-11 (in Chinese with English abstract). Yu Jinjie, Chen Fuxiong, Wang Yonghui, Liang Jiang, Che Linrui. 2012. Origin and rock-forming environment of the granitoids in the periphery of the Shilu iron deposit[J]. Geology in China, 39(6): 1700-1711 (in Chinese with English abstract). Zhang Liang. 2012. Tectonic Evolution of the South China Sea and a Numerical Modeling[D]. Beijing, Graduate University of Chinese Academy of Sciences, 79-79(in Chinese with English abstract). Wang Xiaofeng. 1991. 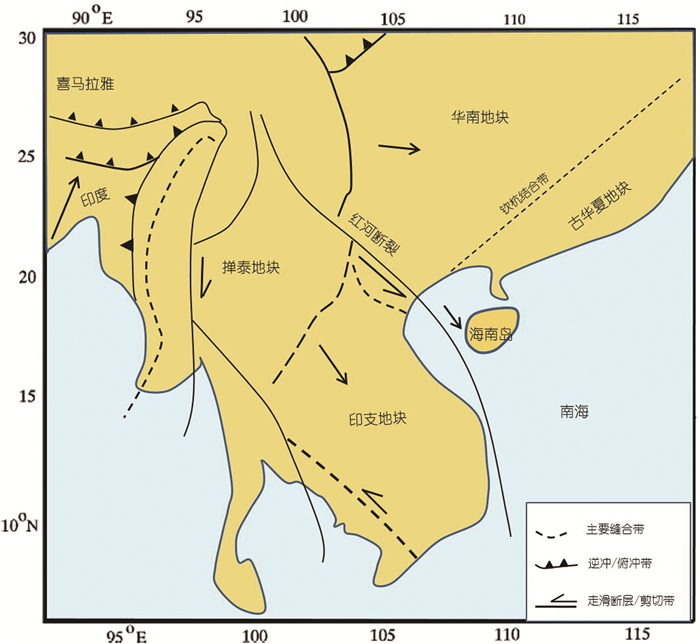 Hainan Island Geology (Chapter 3:Tectonic)[M]. Beijing: Geological Publishing House, 3-29 (in Chinese). Zhang Qimeng, Hap Fang. 1997. Evolution and hydrocarbon system in Ying-Qiong basin[J]. Science in China(Series D), 27(2): 149-154 (in Chinese). Zhang Yeming, Xie Caifu, Fu Tai'an, Li Zhihong. 2005. 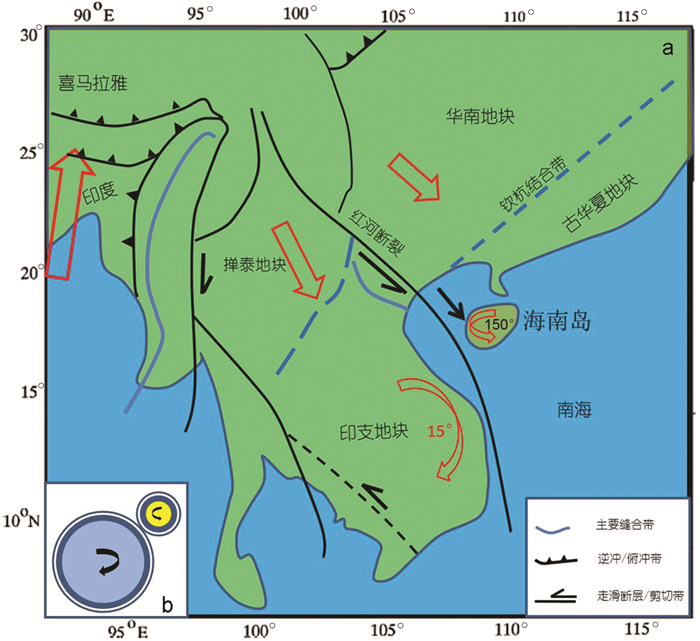 Tectonic evolution of Hainan Island[J]. Science Technology and Engineering, 5(20): 1485-1487 (in Chinese with English abstract). Zhao Guoqiang, Su Xiaoning. 2014. 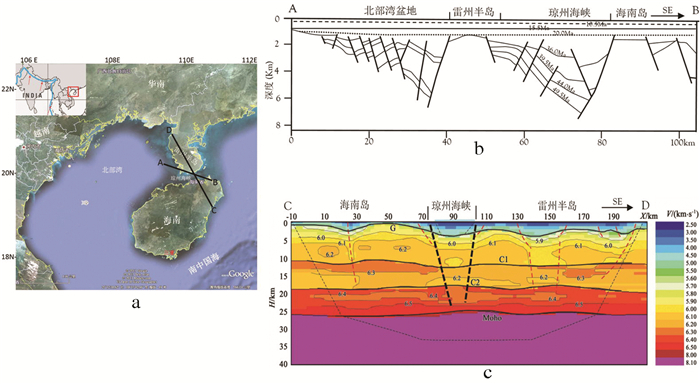 Present-day crustal movement velocity field in Mainland China derived from GPS observations[J]. Earthquake, 30(1): 97-103 (in Chinese with English abstract). Zhao Huanting, Wang Lirong, Yuan Jiayi. 2007. Origin and time of Qiongzhou strait[J]. Marine Geology & Quaternary Geology, 27(2): 33-40 (in Chinese with English abstract). Zhong Dalai, Ding Lin, Liu Futian, Liu Jianhua, Zhang Jinjiang, Ji Jianqing, Chen Hui. 2000. The multi-axial shelf structure of lithosphere in the orogenic belt and its constraints on the magmatism in the Cenozoic era with example of Sanjiang and neighboring zoning[J]. Science in China(Series D), 30(supp): 1-8 (in Chinese). 陈国达. 1956. 中国地台活化区的实例并着重讨论"华夏古陆"问题[J]. 地质学报, 36(3): 239-271. 陈国能, 王勇, 陈震, 彭卓伦. 2017. 花岗岩浆形成定位机制的思考与研究进展[J]. 岩石学报, 33(5): 1489-1497. 陈海泓, 孙枢, 李继亮, Maia Haag Jon Dobson, 许靖华, Friedrich Heller. 1994. 华南早三叠世的古地磁学与大地构造[J]. 地质科学, 29(1): 1-9. 陈长征, 陈伟, 吴峰, 成为, 周进峰. 2014. 北部湾盆地迈陈凹陷东部构造物理模拟研究[J]. 石油实验地质, 36(04): 516-522. 程裕淇. 2002. 中国地质图(1:500万)(第二版)[M]. 北京: 地质出版社. 侯威. 1992. 海南岛地壳演化的基本特征[J]. 大地构造与成矿学, 16(2): 131-140. 嘉世旭, 李志雄, 徐朝繁, 沈繁銮, 赵文俊, 段永红. 2006. 雷琼拗陷地壳结构特征[J]. 地球物理学报, 49(5): 1385-1394. 李四光. 1962. 地质力学概论[M]. 北京: 科学出版社. 李四光. 1974. 旋扭构造[M]. 北京: 科学出版社. 李思田, 张启明. 1997. 盆地形成机制及其动力学类型. 龚再升, 李思田, 王善书, 著. 南海北部大陆边缘盆地分析与油气聚集[M]. 北京: 科学出版社, 111-121. 梁光河. 2013. 海南岛从中国北部湾分离旋转漂移出去的8大证据[J]. 地质学报, 87(增刊): 73-76. 马丽芳. 2002. 中国地质图集[M]. 北京: 地质出版社. 能源, 吴景富, 漆家福, 张功成, 何玉平, 苏克露, 廖晶. 2011. 琼东南-珠江口盆地深水区构造样式及其分布特征[J]. 天然气工业, 31(8): 32-37. 任纪舜, 金小赤. 1996. 红河断裂的新观察[J]. 地质论评, 42(5): 439-442. 孙珍, 钟志洪, 周蒂, 丘学林, 吴世敏. 2003. 红河断裂带的新生代变形机制及莺歌海盆地的实验证据[J]. 热带海洋学报, 22(2): 1-9. 孙珍, 钟志洪, 周蒂. 2007. 莺歌海盆地构造演化与强烈沉降机制的分析和模拟[J]. 地球科学——中国地质大学学报, 32(3): 347-356. 万天丰. 2011. 中国大地构造[M]. 北京: 高等教育出版社, 1-501. 王二七. 2017. 关于印度与欧亚大陆初始碰撞时间的讨论[J]. 中国科学:地球科学, 47: 284-292. 汪啸风. 1991. 海南岛地质(三):构造地质[M]. 北京: 地质出版社, 3-29. 许德如, 陈广浩, 夏斌, 陈涛. 2003. 海南岛几个重大基础地质问题评述[J]. 地质科技情报, 22(4): 37-44. 杨树锋, 虞子冶, 郭令智, 施央申. 1989. 海南岛的地体划分、古地磁研究及其板块构造意义[J]. 南京大学学报(地球科学), 1(1/2): 38-46. 杨振宇, Jean Besse, 孙知明, 赵越. 1998. 印度支那地块第三纪构造滑移与青藏高原岩石圈构造演化[J]. 地质学报, 72(2): 112-125. 殷鸿福, 吴顺宝, 杜远生, 彭元桥. 1999. 华南是特提斯多岛洋体系的一部分[J]. 地球科学——中国地质大学学报, 24(1): 1-11. 余金杰, 陈福雄, 王永辉, 梁将, 车林睿. 2012. 海南石碌铁矿外围花岗岩类成因及形成的构造环境[J]. 中国地质, 39(6): 1700-1711. 张启明, 郝芳. 1997. 莺-琼盆地演化与含油气系统[J]. 中国科学(D), 27(2): 149-154. 赵国强, 苏小宁. 2014. 基于GPS获得的中国大陆现今地壳运动速度场[J]. 地震, 30(1): 97-103. 赵焕庭, 王丽荣, 袁家义. 2007. 琼州海峡成因与时代[J]. 海洋地质与第四纪地质, 27(2): 33-40. 钟大赉, 丁林, 刘福田, 刘建华, 张进江, 季建清, 陈辉. 2000. 造山带岩石层多向层架构造及其对新生代岩浆活动制约——以三江及邻区划为例[J]. 中国科学(D辑), 30(增刊): 1-8.